The artist is Mark Ryden (contemporary) and I really like this “Weird and Bad Art,” by which the title of the piece is “Birth of a Parsnip.” Like I said (in a previous post) appreciating art is often subjective. I found this painting very interesting. Strange, yes (in an interesting way) but certainly not bad. Why did I think of that episode? I’m not really sure. The first thing that came to mind was that the sick looking Parsnip reminded me a lot of poor Halima; the nice (Aswang) Fae Lady who became ill from the toxic human foot she put in her soup. This Parsnip has the same sort of body language going on as Halima did. And also the worried look on it’s face (although it’s apparently giving birth so the discomfort is understandable). In general, the overall feel of the Parsnip situation reminded me of Halima. The overall bizarreness of the entire situation is notable. 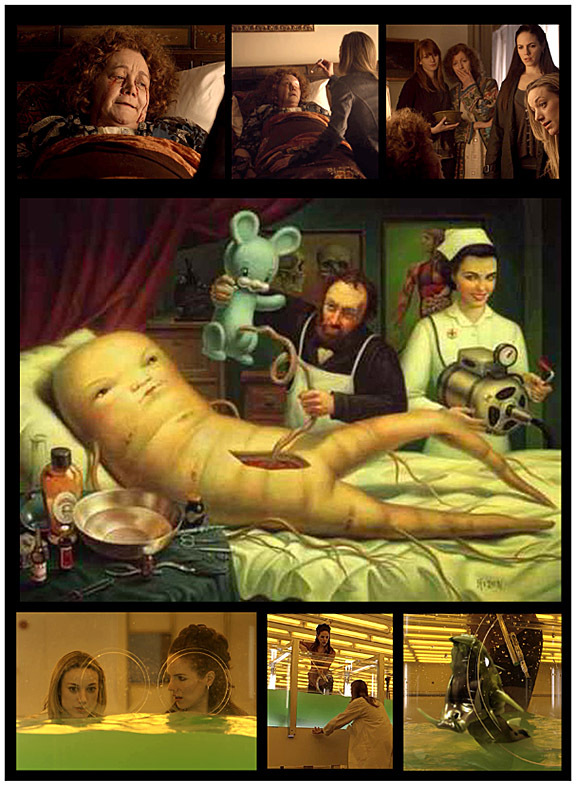 I don’t know what that rubbery animal is that is being used for the Parsnip’s transfusion? Is it a Blue Mouse? And that nurse looks a little psychotic! What kind of Doctor is this Doctor? A Vegetable Doctor? All this “Weirdness” reminded me of some of the “Weirdness” that Lost Girl plays with often, and pulls off nicely. One of my favorite lines was from Doctor Lauren trying to figure out Halima’s illness. “I’m not liking what I’m seeing…could it be due to someone you ate?” That line is delivered with such sincerity, so deadpan, and yet it’s completely hilarious and utterly ridiculous. However, as viewers, we know we’ve entered a world where, yes, these Fae are a completely different species than us humans. And so the idea of a Blue Mousey figure being used as the means to transfuse a Parsnip isn’t really that bizarre. No more so than a Green Snaky creature (the Basilisk) being used as the source of transfusion (anti-toxin) to heal Kenzi. We have Doctors and Nurses (or helpers, such as Bo) and strange gadgetry and medicines and stuff. If you combine the colors of Halima’s blanket (deep red) and the dim lighting in her room they compare nicely to the top portion of the Parsnip painting; the deep red drapes, the beiges, and the shadows. Whereas, the lower half of the painting is almost as toxic in it’s brightness (as well as the hue) as that of the lighting and aquarium at the chemical company. At one point in the episode Trick trades a valuable chain necklace for an Abath Horn. What is an Abath? Do you know? I don’t (well, the wiki says it’s the horn from a female unicorn). This Abath horn is ground into tea to keep Kenzi’s hemorrhaging at bay while Lauren and Bo are off hunting toxic Basilisks at the chemical company. What is The Food for Thought ? Kenzi mooched (a meal) like she is known for doing and paid a high price? The Fae eat people like we do animals and don’t think twice about it ? Unless it makes them sick? Do you like to eat Parsnips? Did the Parsnip have a successful delivery? I have no idea but I enjoyed looking at this painting and seeing some strange parallels with this Lost Girl episode. As a p.s. Mark Ryden is an accomplished contemporary artist who has designed album covers for Aerosmith and Michael Jackson, as well as illustrating book covers for authors such as Stephen King. The piece you chose reminds me a bit of this children’s book that I once read. “Stinky Cheese Man and Other Fairly Stupid Tales” by Jon Sciezka. It’s this whimsical but intelligent book that contains sarcastic moral lessons for any age using a few recognizable fables. Still, if this episode was a story in that book I mentioned, the title would be like, “Why People with Deadly Peanut Allergies Shouldn’t Eat Random Crap in an Aswang’s House,” and Kenzi would be just right where that parsnip is, Trick as the creepy doctor, and Lauren would be the hotter stand-in for that Nurse Ratched. Well done again! I’m always impressed at the visual connections you draw in these pieces. And here also, through the juxtaposition, there is an unexpected exploration of the grotesque in the Food for Thought episode. Thank you Cleo. 🙂 Grotesque is the perfect word because I found myself experiencing the episode much differently while thinking of it and looking at this painting. Great piece again! And a nice way to revisit a great episode. I’m just a bit confused… Looking at the painting at was under the impression that the blue mousey figure was not a mean of transfusion but the child taken out by way of a caesarian section, still attached with the umbilical cord. Hi Nic. 🙂 Thank you for reading again and sharing your thoughts. I was confused a bit too, by the Parsnip and what was going on, and still am. You may be right. The Blue Mousey could be what the Parsnip gave birth to and I thought that at first too. 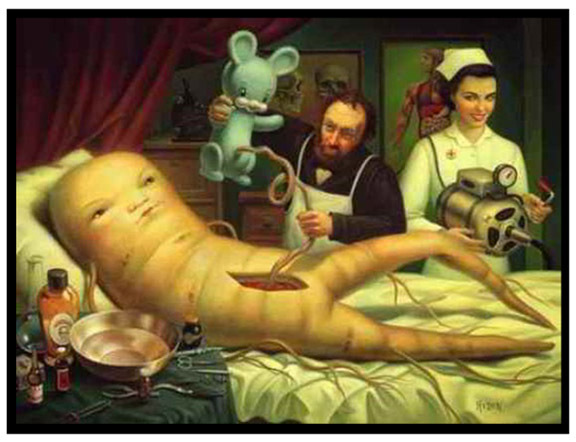 But then I wondered why the painting was titled “Birth of a Parsnip” ?? The Blue Mousey looks nothing like a Parsnip and also doesn’t even look animated, or alive even, compared to the other figures. It’s eyes are open, but it has a fixed expression on it’s face, like a cartoon character, and it looks like it’s made of rubber or something. The other figures are given more life, somehow, in the way the painter rendered them. So, I ended up concluding that the Blue Mouse was part of the procedure not the end result. I could be wrong because I didn’t find an analysis of the painting anywhere. And then I went off on my own tangent while relating it to the episode.